Reasonable shelter, clockwise, from southwest to north. 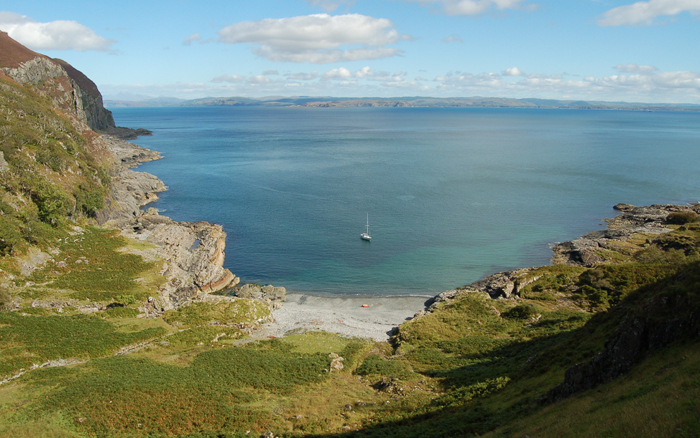 Should unlisted and unspoilt anchorages in the west of Scotland be kept a secret? Well, they're not really a secret, because they're all charted for a start, and anyone looking to drop the anchor just needs to check the chart. There are excellent spots listed in the supplement at the back of the CCC Sailing Directions as ’occasional‘ anchorages, yet despite that listing, many are rarely visited. There are many other decent places to drop an anchor that will probably never be listed, perhaps because of potential weather exposure, but still good places to stay nonetheless. In any case, out-of the-way places are are not everyone's cup of tea; but they are mine, and seeking them out is great fun. There are a few on my personal list for the future. Sometimes it‘s just chance; we were cruising down past Loch Spelve the other day, intending to head in rough direction of the Garvellachs (passage planning at its best imho). We had a good breeze for most of the time and were being followed by a square rigger that seemed to be heading for Colonsay. 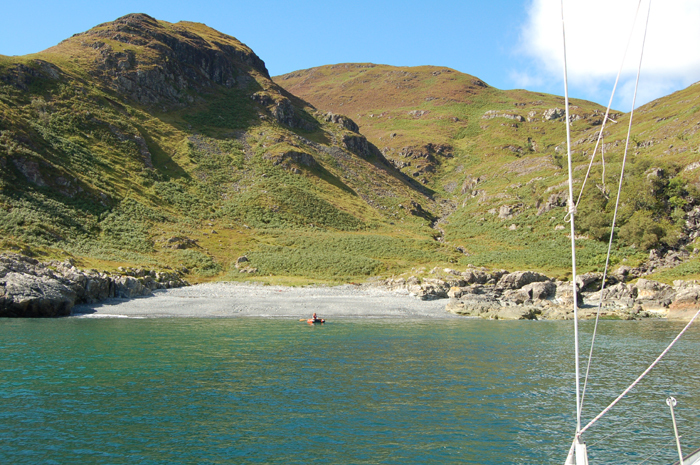 While looking at the chart we noticed a small bay further down towards Loch Buie, near Frank Lockwood�s Island. We fancied taking a look. 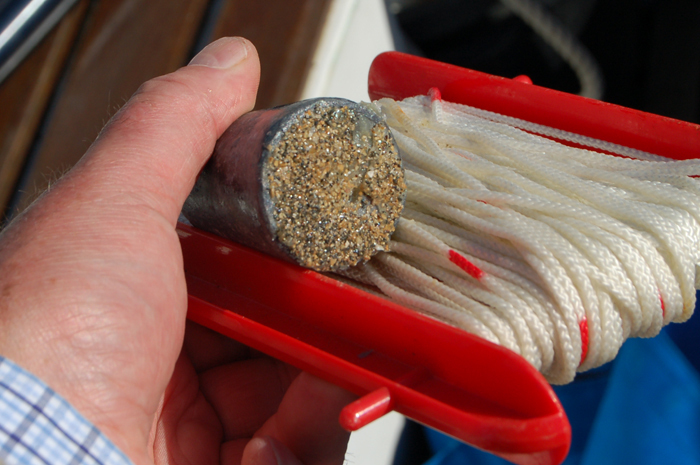 We sailed about three cables off the cliffs, but didn�t experience any freaky winds. The cliffs are impressive, riven by narrow deep cut chimneys. About a mile or so to the east of Frank Lockwood’s Island, the bay at Port Ohirnie started to open out. The approach into the bay is straightforward. Through the binoculars, the shoreline looked very stony, and we had some initial doubts about the holding. We anchored in about 5m, and the hook dug in well. Plumbing the depths with the lead and some grease revealed a sandy bottom. There was a very thin layer of weed debris over some of the sand, but this was of no consequence, and there was no sign of active weed growth in the anchoring area. With fine views across to the Puilladobhrain area, the Garvellachs and Scarba, the bay is sheltered from, clockwise, southwest to the north. Given the open situation it would be reasonable to expect some swell, although there was almost none in a NW F4. I'd be quite happy to anchor there overnight in settled conditions, but with a forecast of F6 from the south we later sailed to Eilean Dubh Mor/Beag for the night. The anchoring area looks constricted from the boat, but the view from the hill, Odharnaidh (Ohirnie), reveals ample swinging room. Ashore, there is beautiful clear fresh water (not peaty) from a stream that enters the north end of the bay. The area must be only be very rarely visited; there were no boot marks on the goat tracks that I followed. The only signs of human habitation were the remains of the walls of what was probably either small black house or perhaps a bothy. 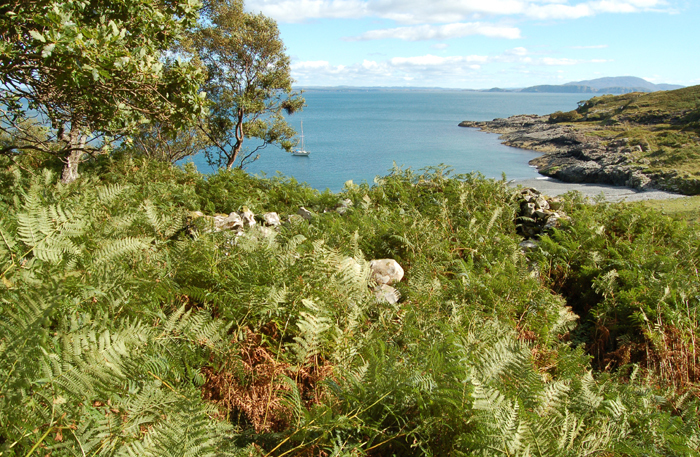 When working from Iona along the S side of Mull this is a remarkably sheltered place to slip into for an hour. It is not mentioned on any list and has high cliffs which often support Eagles. From the W keep well S and E of Frank Lockwood‘s Island and steer up the centre of the harbour as indicated on the chart.